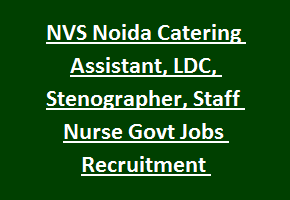 NVS Noida Catering Assistant, LDC Jobs Recruitment 2017: Navodaya Vidyalaya Samiti NVS, Noida has published notification to recruit qualified/ talented candidates for the engagement of Audit Assistant, Female Staff Nurse, Stenographer, Catering Assistant, Lower Division Clerk LDC Jobs. There are total 178 Non- Teaching vacancies available in NVS Noida Recruitment. Qualifications, Age limit for each post are mentioned in the notification. Candidates willing to apply for NVS Recruitment jobs may go through the official website http://nvshq.org/. Select desired vacancy and submit application forms through online from 12/11/2017 to 13/12/2017. Application fee for Staff Nurse and Catering Assistant is Rs. 1000/- and for other posts in NVS Noida Recruitment is Rs. 750/-. No application fee for reserved category and PH/ Ex-serviceman. For Application procedure, Application fee payment method, Important dates, selection process, Qualifications, Pay Scale of Navodaya Vidyalaya Samiti, Noida Staff Nurse, Stenographer, Catering Assistant, LDC Recruitment, Please follow the below given details. Total available vacancies in Navodaya Vidyalaya Samiti NVS Noida Recruitment are 178 posts. 2. Female Staff Nurse: 23 posts. 4. Catering Assistant: 61 posts. 5. Lower Division Clerk LDC: 68 posts. Maximum age limit for Audit Assistant, Female Staff Nurse is 30 years. For Stenographer, LDC Jobs is 27 years. For Catering Assistant jobs is 35 years. Catering Assistant: Senior Secondary Examination passed or equivalent and Diploma (3 years) in Catering or equivalent from recognized institution. Lower Division Clerk: 12th pass with 50% marks or equivalent qualification and having typing knowledge with the speed of 30 WPM in English and 25 WPM in Hindi. For other posts qualification details see the NVS notification. Candidate selection for NVS Noida Recruitment Jobs is based on written exam/ Interview. See the NVS notification for selection process details. Application fee for the candidates of SC/ST/ PH/ Ex-serviceman is nil. Interested candidates log on to the official website of NVS http://nvshq.org/ and apply for desired job. Read the detailed instructions mentioned in the notification. Fill the application and submit with Xerox copies of documents through online. NVS application submission starts from 12-11-2017 and last date is 13-12-2017.